The 15 tours available through this app take you through the winding alleyways of the Old City of Jerusalem on a fascinating journey through space and time, in a city that has been a major center of religious and spiritual worship for thousands of years. 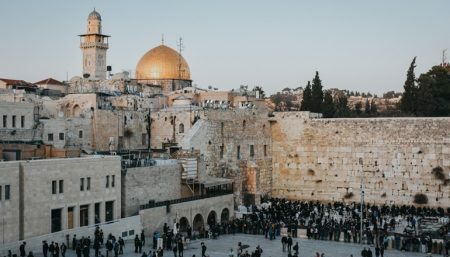 With so many tours to choose from, you’ll be able to decide if you want to focus on the story of the Jews, including the creation and destruction of the two Temples, walk in the footsteps of Jesus or delve into the holy sites of Islam inside the walls. Explore the quarters, churches, including the Church of the Holy Sepulchre, synagogues, mosques, historical places, the colorful marketplaces, the Western Wall, the Dome of the Rock and the Garden Tomb while listening to in-depth descriptions at your own pace. These audio guides will take you to visit major attractions and discover hidden places, all in a quieter, more personal way, with your mobile device. All tours include accurate directions in order to help you navigate your way through the winding streets and alleyways. Each tour is accompanied with a map that offers GPS navigation and is available offline when no service is available. Five of the tours are handicapped accessible offering alternative verified routes to make sure you get the most out of your visit to the Old City of Jerusalem. All tours are also presented with a full audio transcript for the hearing impaired.